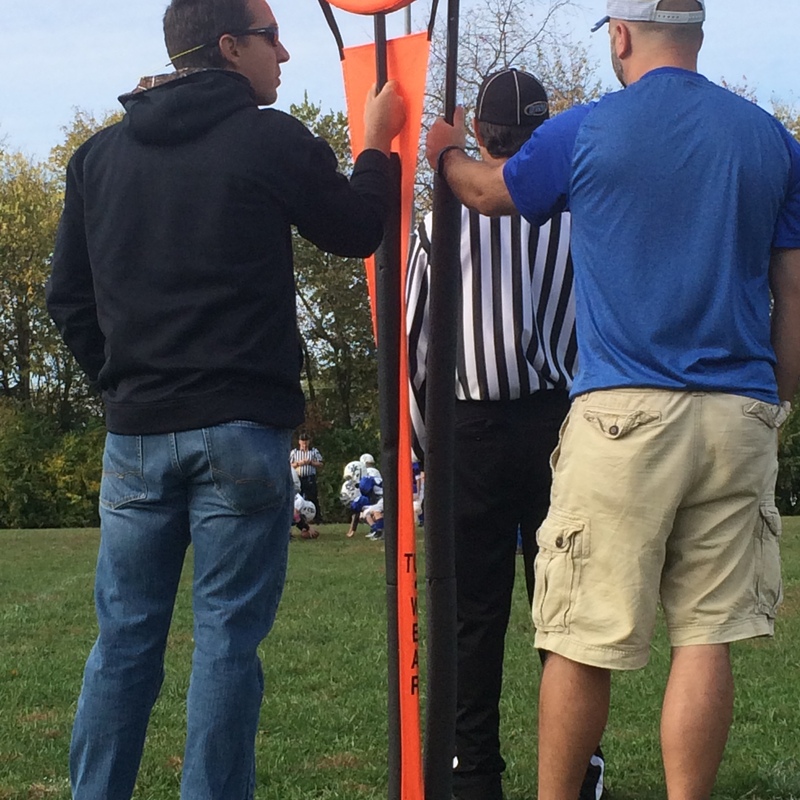 Saturday October 24, 2015. Louisville, KY. Cloudy, 65(ish) degrees, humid. 8:30 am. Registration: This was available online, price increased closer to race day. 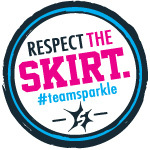 You could also register at packet pickup, but there was no race day registration. Registration included a gender specific long sleeve tech shirt, a bib with timing strip, an Uber discount, and the Race Joy Mobile App. I did not use the Race Joy Mobile App, which was the race tracking service, and included cheers. My phone is low on storage. I prefer a text update service, but it was nice to allow participants this service at no cost. It looks like family could purchase for 99 cents. 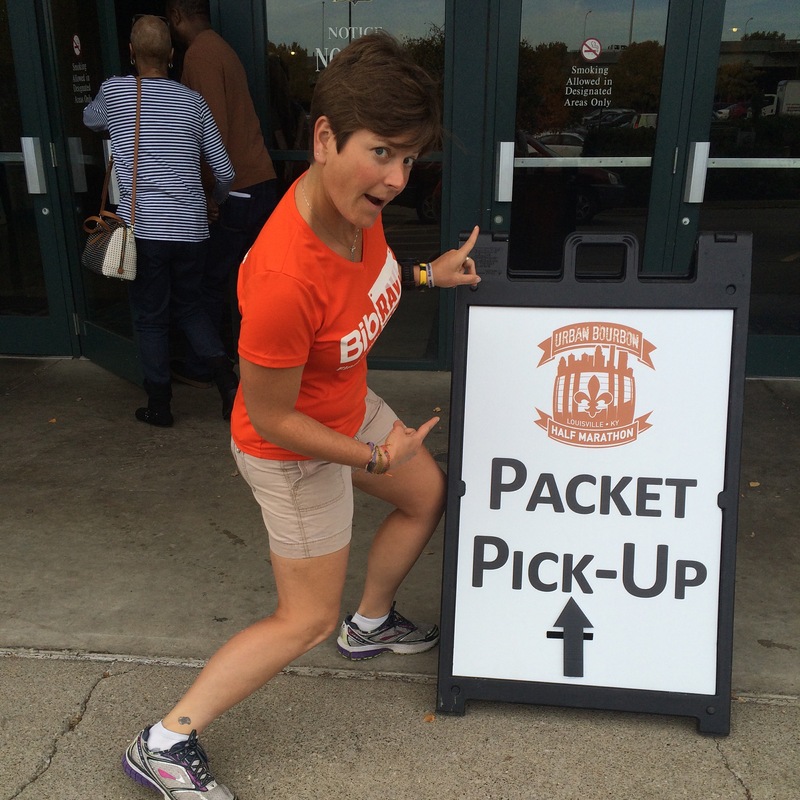 Expo/Packet Pick up: There were 2 days to pick up your packet at Louisville Slugger Field. Thursday and Friday before the race. For an additional fee, participants could chose to do a VIP packet pick up at the Evan Williams distillery. There was no race day packet pick up. A virtual race bag was sent to runners a few days before, in addition to many informational emails. There was free parking. There was a small expo at the general packet pick up. Bib numbers were posted, and then you proceeded to the correct volunteer, where you were handed a bib after checking your ID. Then because the race was for people 21 years or older, a wrist band was placed on your wrist, to wear until the post race was over. This band had the tickets for the post race food & drinks. After grabbing a bib and band, then it was off to pick up the race shirt. The shirt was in a sealed plastic bag, volunteers encouraged you check out the shirt station, before opening your bag. At the shirt station they had opened bags, available to look at or try on. If the better fitting size was available, you were allowed to exchange your shirt. There was some merchandise available to purchase from the local Fleet Feet, where the pace team could also check in. There were race cotton shirts available to purchase. 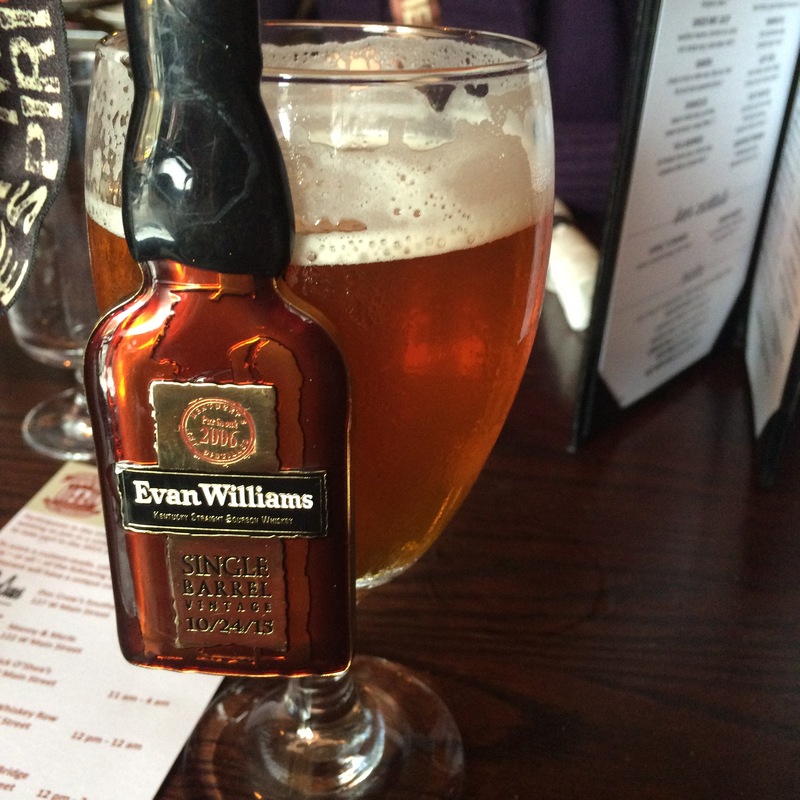 Evan Williams was there with 4 bourbons to sample and a gift basket drawing. There was one table to find out race information. There were a couple of massage tables for free. *On Friday there was an additional event held at the same location. I was running this race with Laura. We had no problem with parking or getting in and out. I was happy there was a shirt exchange and the fit was off and I had to size up. The sleeves fell really short and the shirt was short at the waist. We also arrived at the time when there was to be a race director question / answer session, nothing happened at that time, however the table with information was more than happy to help answer all questions. Laura and I hit a local place for supper that night, as a recomendation from the information guy. It was an old service station, great atmosphere. It appeared it was the place to be for happy hour. 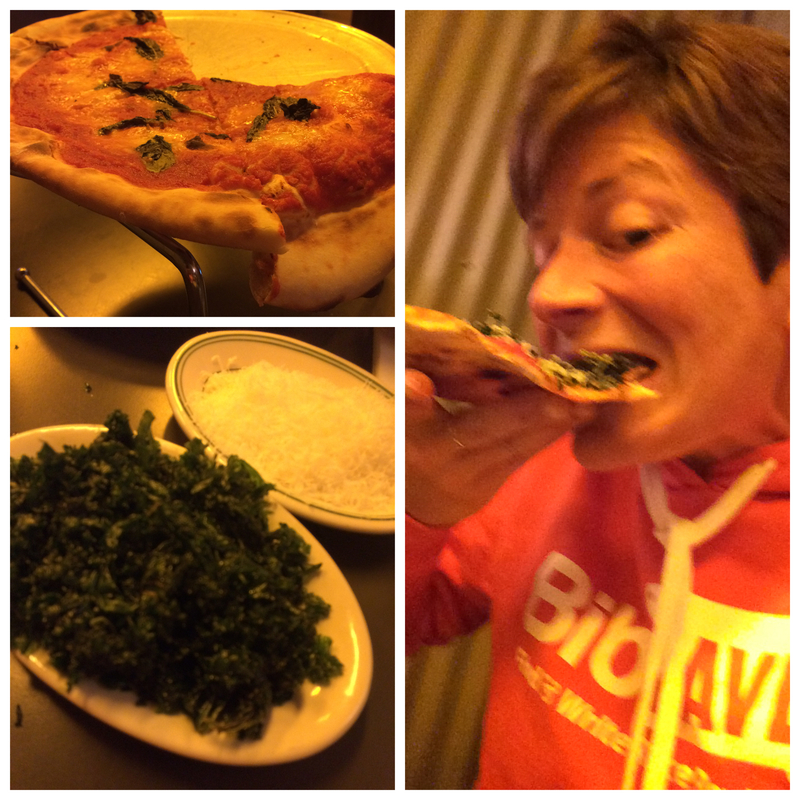 We ordered a delicious pizza and I introduced Laura to kale. 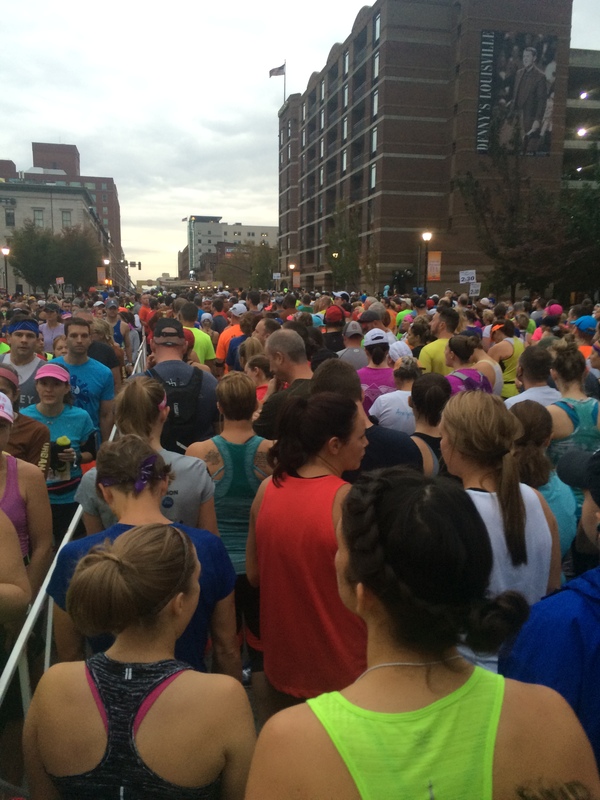 Pre-Race: The race started in downtown Louisville, in front of the Yum! Center. There was an arch signifying the start line and a gated off starting area, with one entrance at the back it was about a block long. There were no corrals, but once in the gated area runners were encouraged to line up according to pace, or near a pacer. 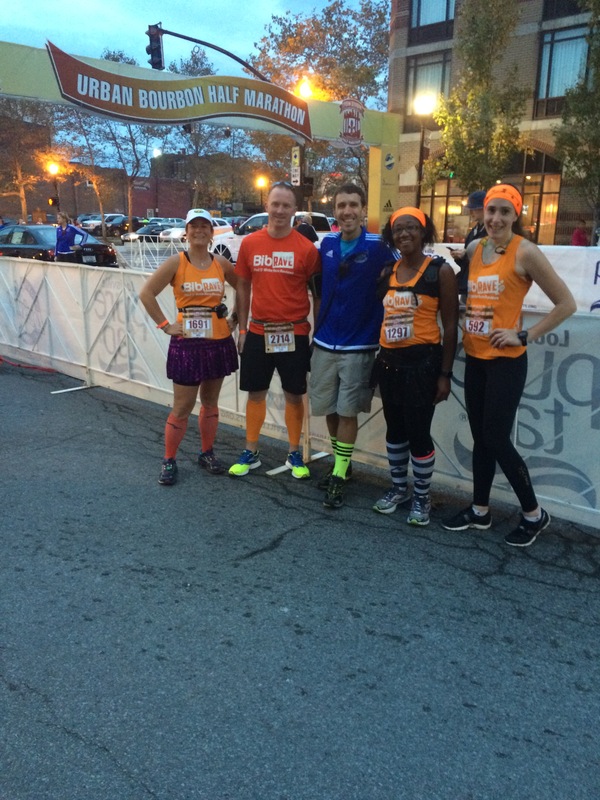 Pros – Erica and Jessica were able to meet the RD, the evening before, and mentioned a pre-race photo. Great work ladies! Parking available in many downtown area ramps, which you had to pay for. There were bathrooms open to the runners at 2 nearby hotels, and some port-o-potties set up under the bridge in the area. There were volunteers standing in the area with signs that said something like “How can I help?” There were a couple water coolers with paper cups for water. There was a trumpet player who played “My Old Kentucky Home” followed by a the National Anthem on trumpet. There were not enough bathrooms close to the start, the lines were insanely long, and the hotels were a couple of blocks walk away from the start. I am not sure what the policy is or cost, but starting in front of the basketball arena, maybe they could use the facilities in there in the future. As a fun fact, the trumpeter hails from Cedar Rapids, IA. We asked to take a photo with him (cred Pro Jess) and he noticed the tigerhawk on my hat. Laura kept up the conversation, and eventually found out all the Iowa details. 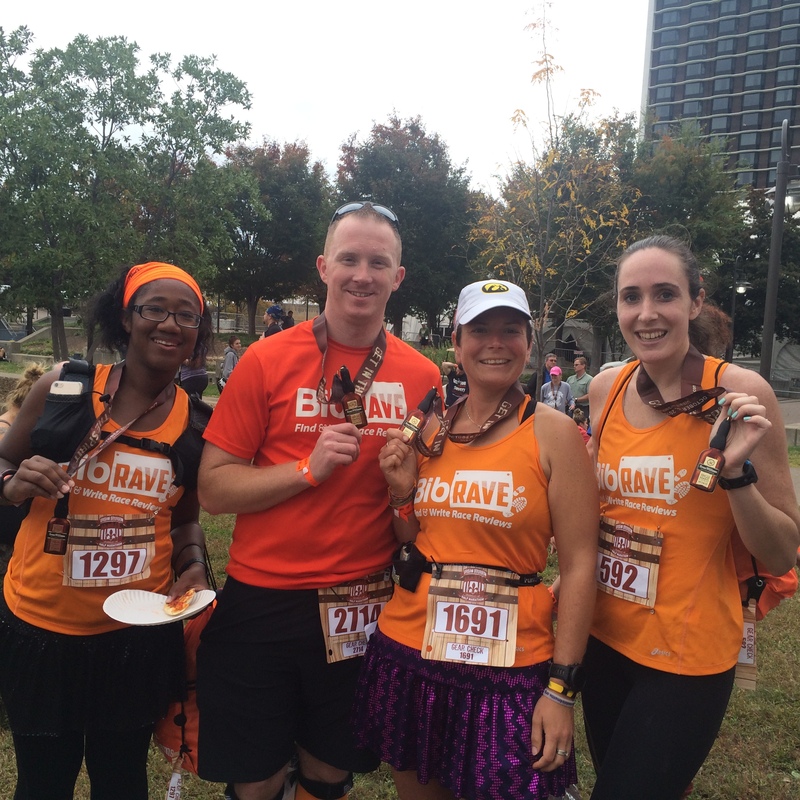 Race/Course: The race started and finished in downtown Louisville, and took you through Cherokee Park. Surface – the entire course was ran on pavement or asphalt. There were repaired areas or small holes, nothing major. Terrain – Downtown Louisville is flat, but the areas around the park are hilly. Nothing too steep, however if you don’t train on hills, the course can prove to be a challenge. 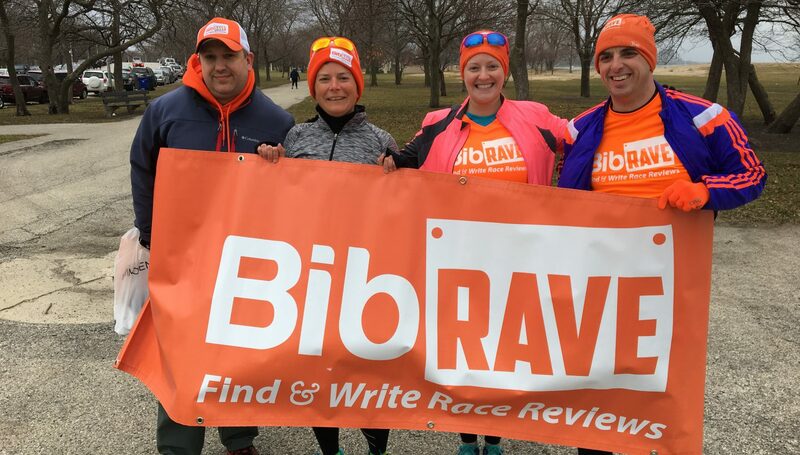 Scenery – There was the pretty park in the fall with the colorful leaves, downtown buildings and an all men’s homeless shelter along the course. Mile Markers – Each mile was marked with a big sign, there were clocks at these. Volunteers – There were volunteers at each intersection, law enforcement at busy intersection, however some would be clumping and talking amongst themselves. Hydration – There were many stops. A few with water only. Then a few with water and powerade. Each stop had the same design paper cup. They weren’t very spread out and it was hard to figure out, unless you heard the volunteer say which liquid they had. Some roads were open to traffic, running areas were coned off, but most of the course was closed to cars. Timing mats throughout the course. There were a lot of turns on the course, which made my watch record a longer distance, (13.38) which isn’t much. About halfway through I started cutting the corners, running the tangents, hoping to stick truer to the course. When I started this, I managed to get ahead of Laura, but she had twisted her leg strange getting to a water stop, and decided to slow down a bit, and walked some of the hills. I motored on without her after about mile 7, I thought I was crushing the course, until I saw a familiar face, apparently I slowed down too much, and there was Laura, just before mile 13. No major frustrations, just a little tweak to the hydration stops. It was humid and I stopped at all of them. They were crowded, if they could have spread them out a bit, had the electrolyte drink in a different colored cup, and before the water, that would have been great. Finish / Post Race: The finish line had the majority of spectators, and could be seen with a timing mat, arch, clock, and photographers. 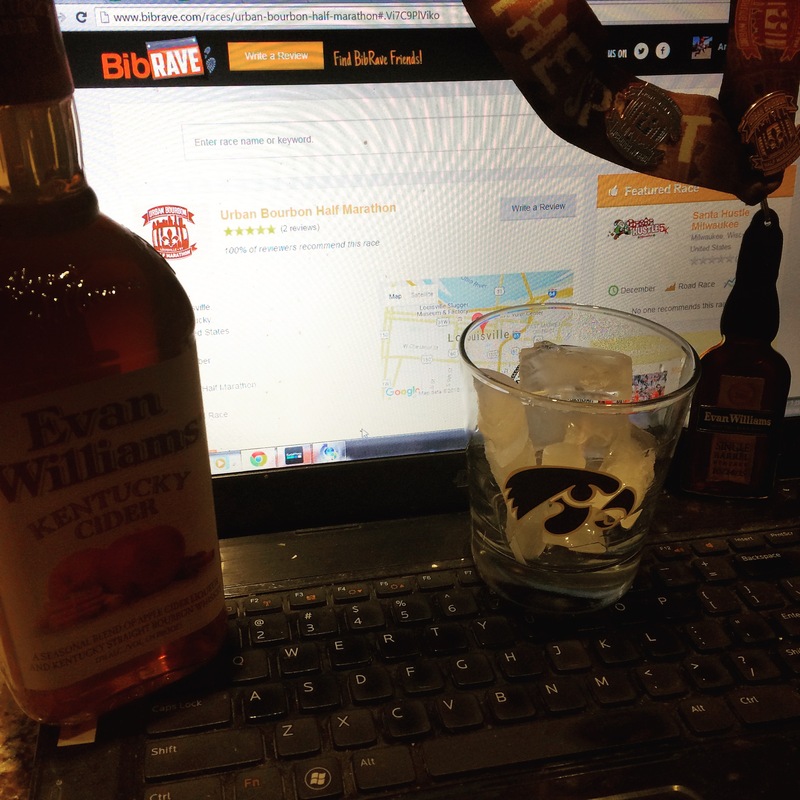 Once across the line, a small bottle of water (maybe 8 oz) was handed to you, an Evan Williams bottle shaped medal was handed to you, then a heat sheet wrapped around you. A quick turn to the post race area, and you walked by the Powerade, chocolate milk, grapes, bananas and Panera bagels. A sign was posted for runners to be respectful and only take one. After this there was the area, in a field, near the Ohio River, for the post race party. 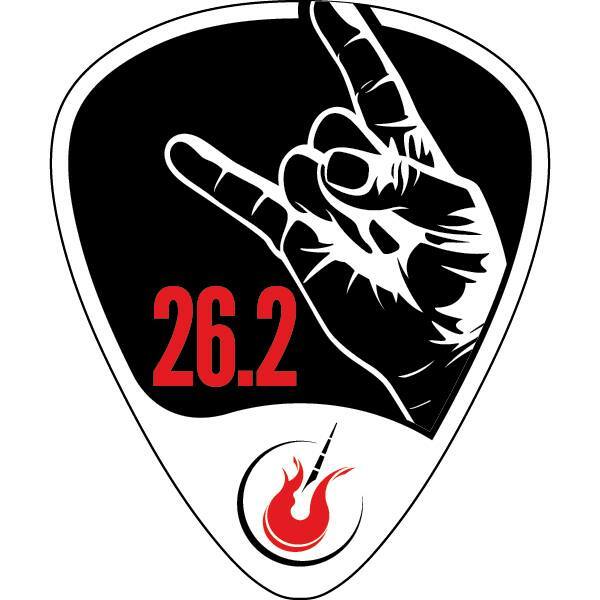 Free to runners, and $20 for non runners. The wrist band each was given at the packet pick up was good for 4 free bourbon samples, one beer, one slice of pizza, and once cup of burgoo. Hi Five Donuts were there selling donuts. Massage was available for $1 per minute. A band was playing cover songs, the lead singer actually sang as he wondered through the crowd. 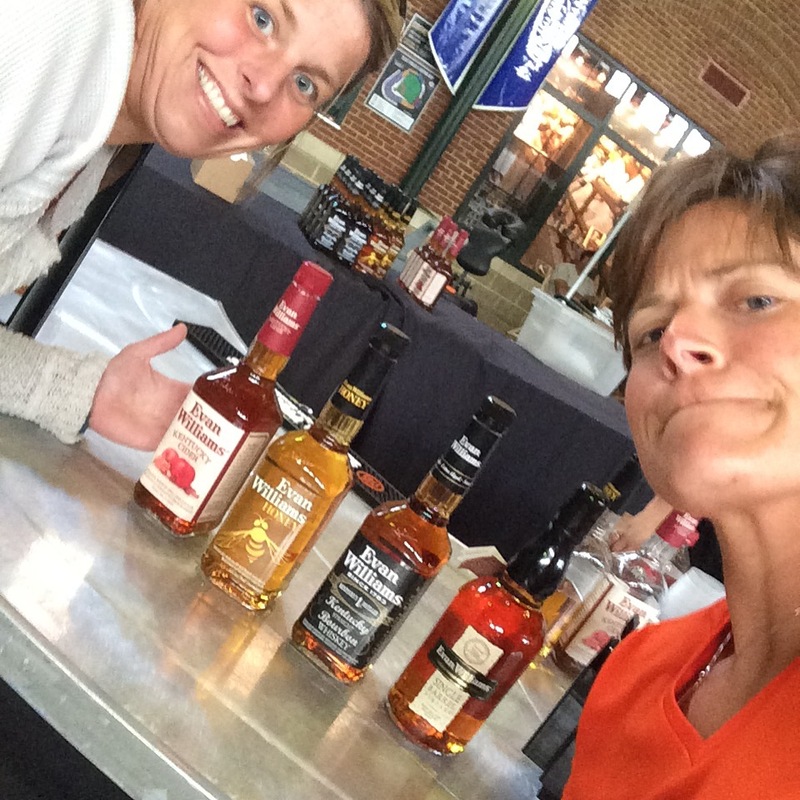 There were many bourbon brands set up, each under a tent. In the big tent was the main sponsor Evan Williams and the Falls City Beer. The bourbon was spread out, but there was a very long line to get beer. There were a few picnic tables scattered about. 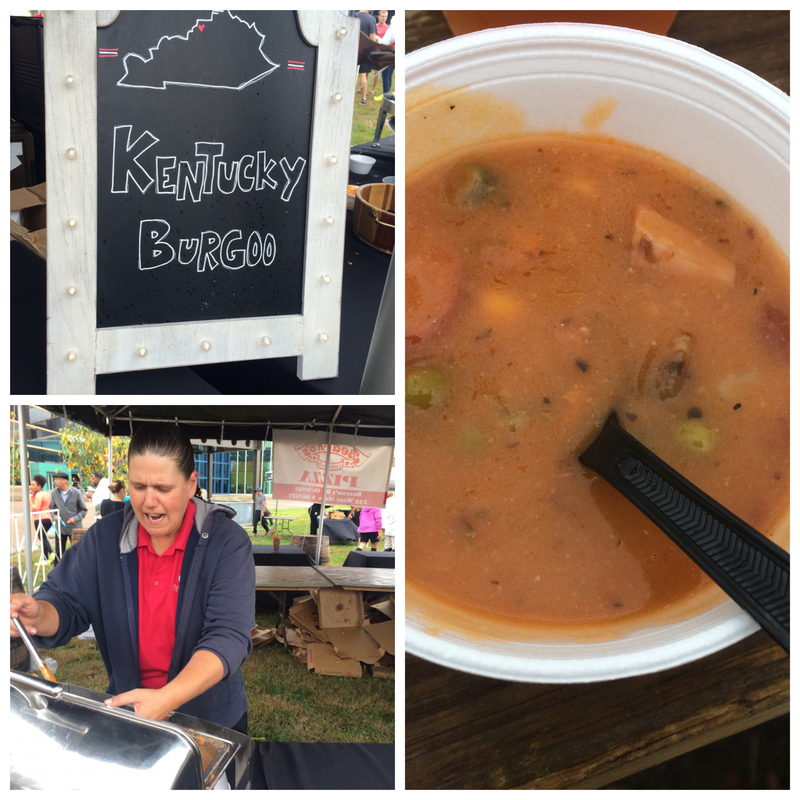 The burgoo (soup/stew) and pizza were under the same tent. The pizza “sold out” quickly, but they came back with more pie about a half hour before the party stopped. There were a bank of port-o-potties in the area, or you could use the hotel. The party wrapped up at 1pm, which gave the last finishers an hour to party, however the music just stopped, but no harsh instruction to leave. The t-shirts went on sale at this time too. 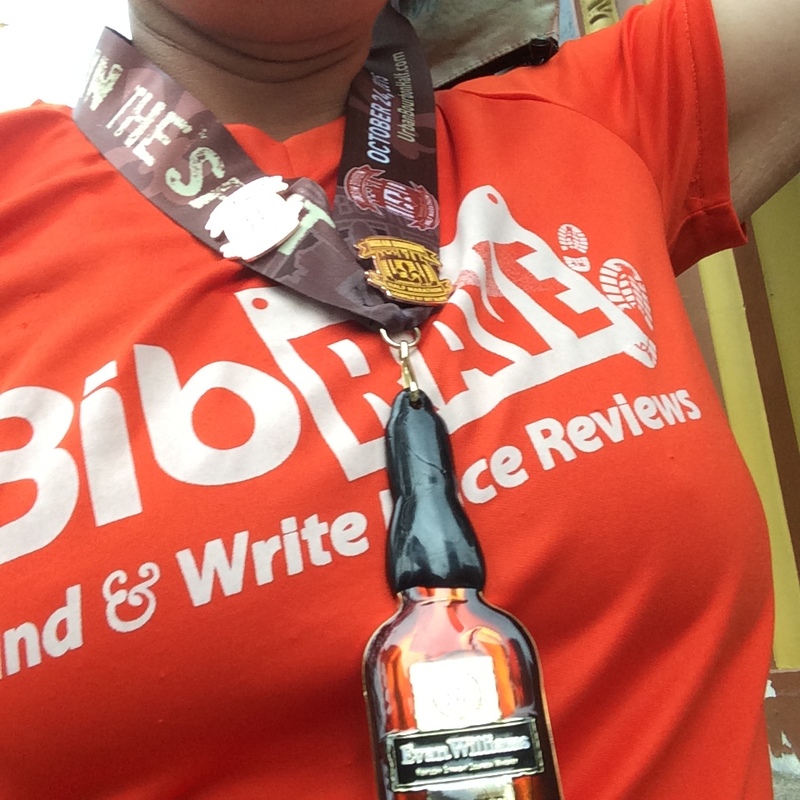 The finishers medal is one of the coolest medals I have seen, it is shaped like a bourbon bottle, but it’s then hand dipped in wax. I was told there is one medal that is half dipped or sideways dipped, if you received that, you were comped an entrance to next year’s event. The ribbon also has the date on it. The post race party was a lot of fun. 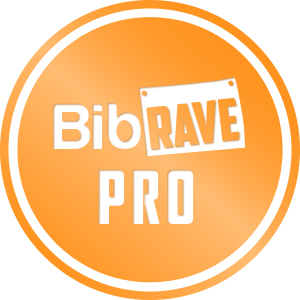 It allowed me to hang out with the other Bibrave Pros attending the race. Also all participants were super friendly, everyone having a good time. I, of course, purchased a $6 donut. 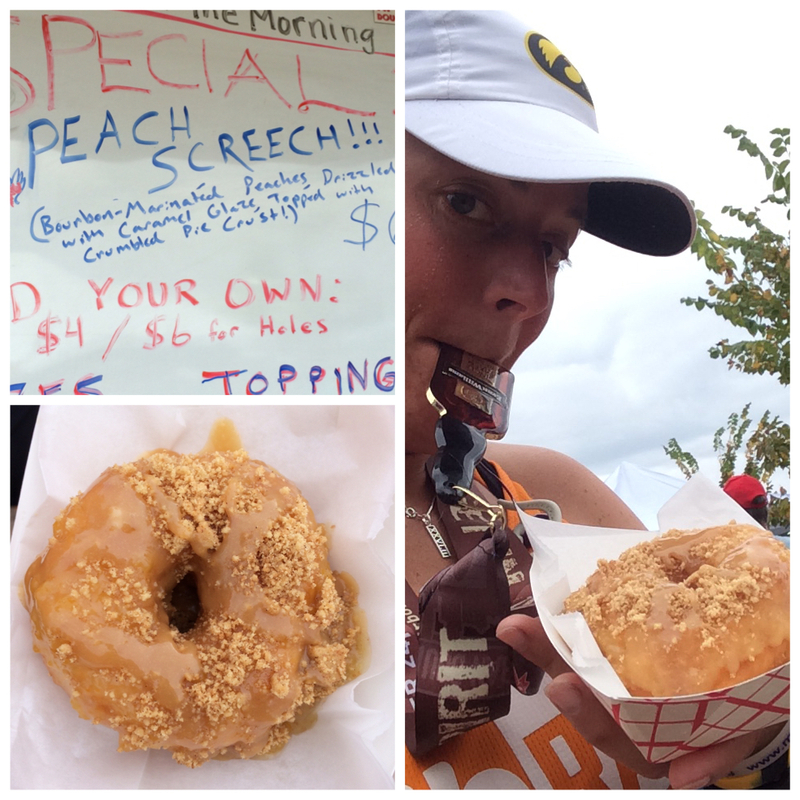 The Peach Screech, it tasted just like peach pie!! I think it was at this party I also realized I am not a huge fan of bourbon, that stuff is strong, I can almost feel the one kind burning my throat. I also came to the conclusion that burgoo is an acquired taste, it smells good, but just has too much going on. Once the post race was over, there was another event happening in an area called “Whisky Row.” Participants could collect up to 5 different pins, from 5 different establishments. Non runners, could get the pins if they purchased a drink with KY bourbon. Some of the bars were open before the post race ended, and were out of pins before we could claim them, each place only had 250. There was only one place opening at 4pm, but it appeared they were giving out pins before that time. We were only able to claim 2. It was a neat idea, but not fair to everyone as it became a contest. Overall: Only a few minor things that can be fixed easily, a reasonable price considering all the alcohol, a good challenging course (fair hills) and friendly people. If you can get this race on your schedule, I would recommend you run it. 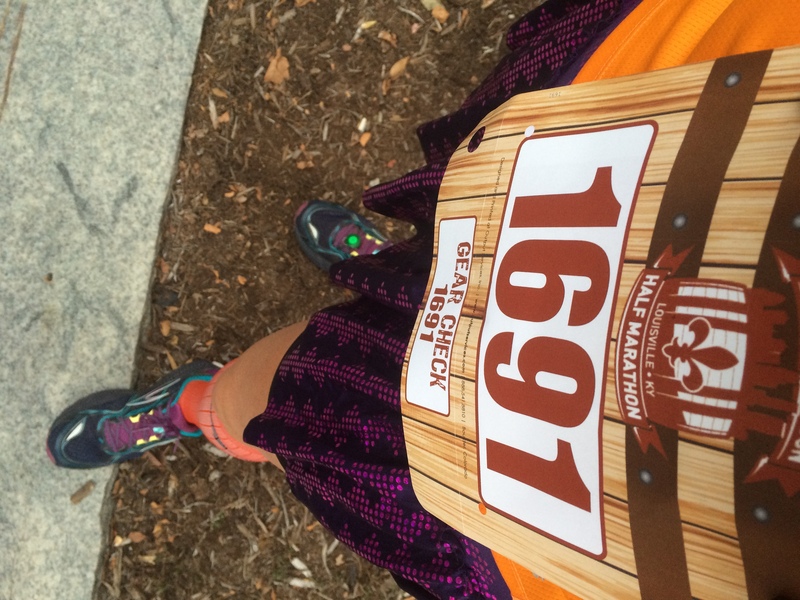 Personal: Coming off Chicago, I wasn’t sure how my feet would feel on another road race. I had been training on trail leading up to the event, and my feet felt good. I pushed to do my best, as always, and hadn’t run a half since August, I wasn’t even training for one. I am also always pushed by Laura, she keeps pushing the pace from the start…even if she walks and meets me again at the finish. I finished in 2:11:14, Laura in 2:11:19. She even met another friendly face to talk with the last few miles. 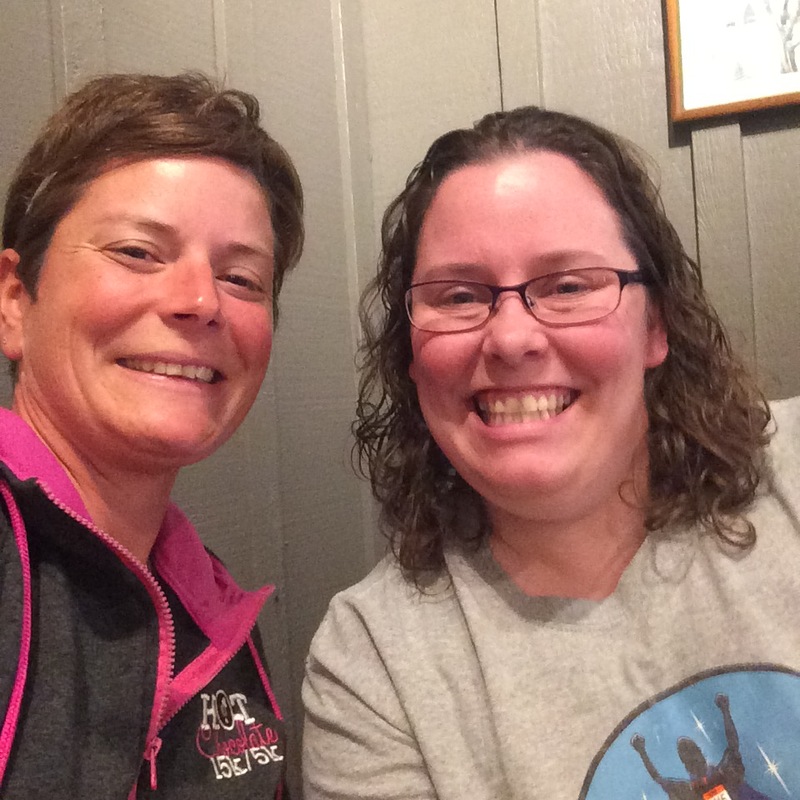 We had a great time in Kentucky, we stayed with family in nearby Lexington, and got to explore the area and enjoy hanging out, and catching up with an old friend. 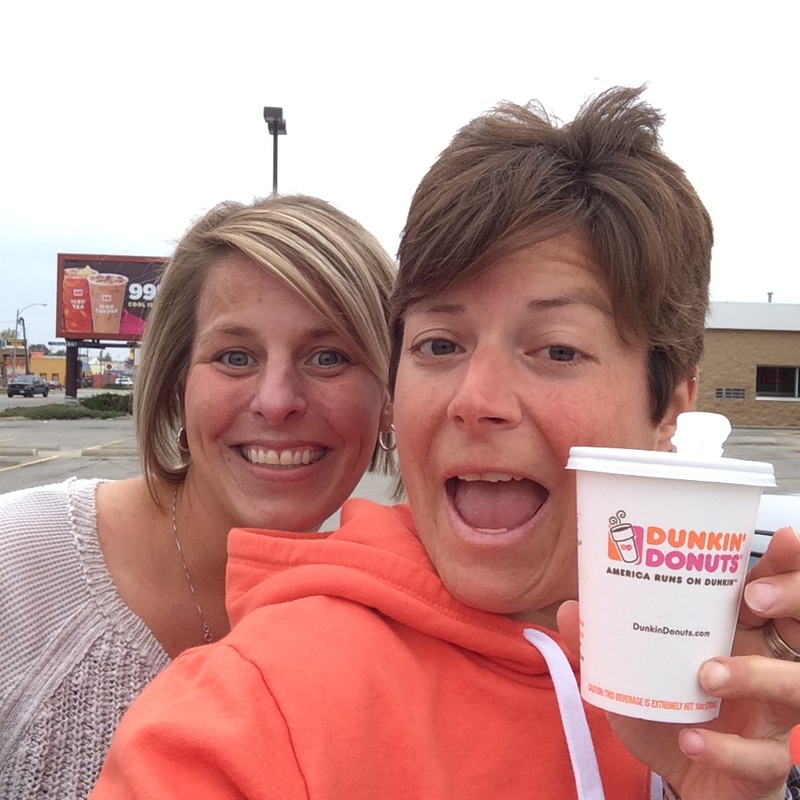 Laura is always up for a good time and a great road trip. Even when we have to take her car at the last minute, she helped me write up this review on the way back in the car. I always encourage people to travel to new places, take your friends and meet new ones, you wont regret it. 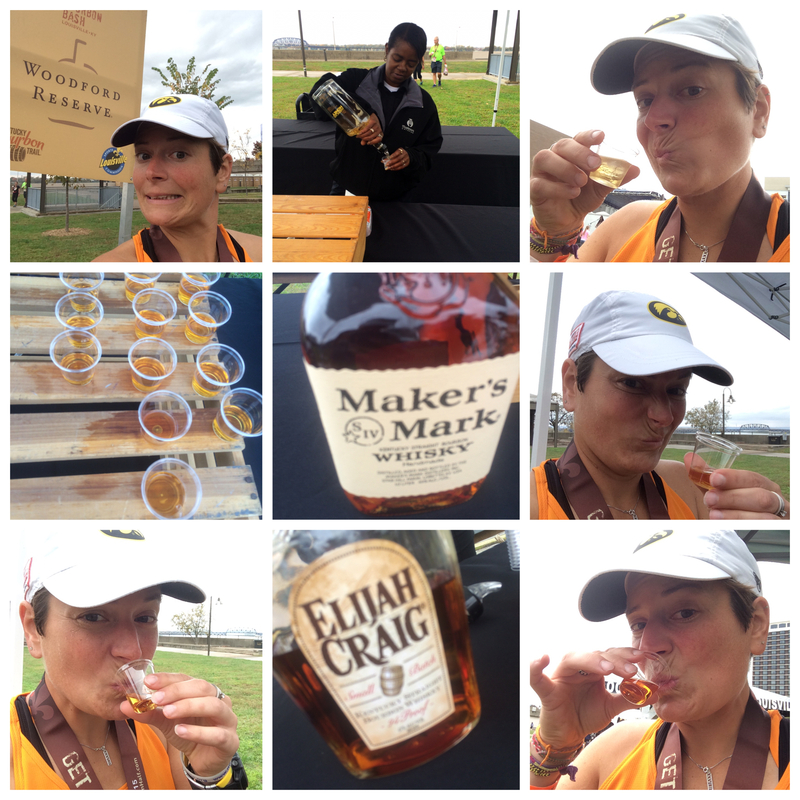 This entry was posted in Uncategorized and tagged #bibchat, half marathon, kentucky races, louisville races, running in kentucky, ubhm, urban bourbon, Urban bourbon half marathon. Bookmark the permalink. 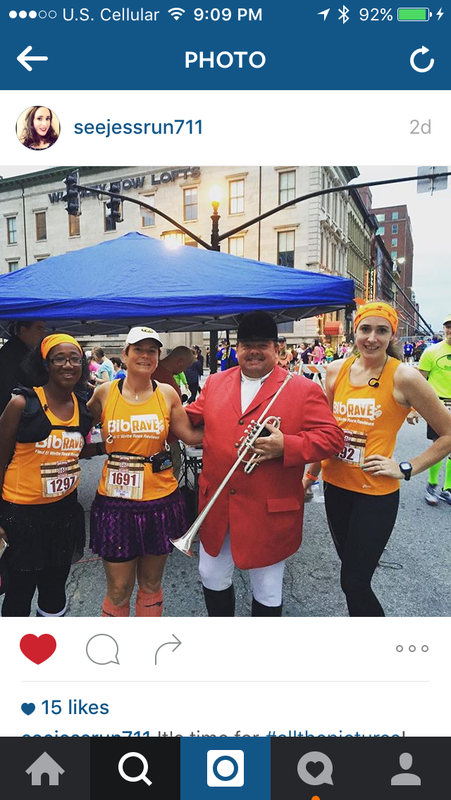 Would the half marathon still be fun if you were on your own for the race and post race? Its expensive so Im a little hesitant…want a great experience! Nice review by the way! Thanks!! Louisville is a great place to explore. If you like to explore food and drinks, that scene is great. Also the Louisville Slugger museum is a great place to visit. I know some fellow pros headed there for the 2016 race, if you wanted to meet up too. 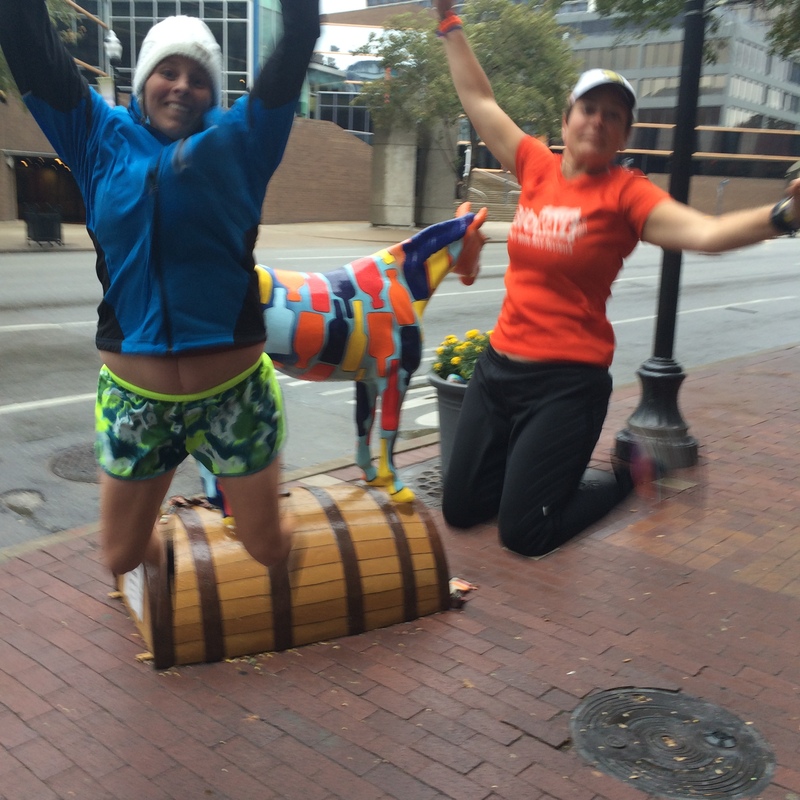 Pingback: What Shoulf You Expect When You Run the Urban Bourbon Half Marathon – Daddy, Did You Win?